Brief BackstoryForlun Merrymantle is a giant of a human being who identifies as a dwarf. Forlun was raised by dwarven parents who were stone craftsmen. His adoptive parents were honest, upstanding people who inculcated a deep sense of goodness in him. This is why Forlun is polite and well behaved (sometimes irritatingly so) with an unshakable optimistic attitude. Once Forlun reached the age of 18, his parents thought he should get some worldly experience. That is why he has ventured out of his small dwarven hamlet for the first time, with nary an experience, but every intention of making the world a better place. Fast posting rate and fast gameplay. I am a beginner to pbp and RPG's in general and super enthused to play as much as possible. Also not averse to min-maxing! I do not have as much of an experience to really answer that. Any questions you might have?? Very new. Currently playing a pbp on another site and a solo adventure (in character creation stage) here. Definitely multiple times a day. However, I am located in India, so time zones may be a limiting factor. Posting rate- most PBP on this forum can goes days before posting. Nope. Seems pretty straight forward. Is 50gp still in effect? Not that I'm a cleric, but what pantheon? GM three games and in a few others. I can post multiple times a day. Last edited by PraetorGradivus; 08-27-2017 at 04:42 AM. We're always open to more players - and with 12K posts in 3 months time, you know there's always some action going on. Posting super high interest. Really excited about a game with zero(?) rejected apps. Waiting to complete my tower of noob game to learn the intricacies of 5e combat (as opposed to 3.5e or pathfinder). Will unleash an idea here shortly thereafter! Due to personal emergency, I am indefinitely withdrawing from this site. Please consider all of my characters terminated. My deepest apologies to others negatively impacted by this. Bump - still going strong. I love that this game is inspired by COEA. I'm seriously fighting the temptation to throw in a Slayer type character in the mix. Stepping away from the site at least until the New Year do to some RL events. Happy gaming until I return and have a great holiday season. Appearance: Kellen is slightly taller than the average gnome, but skinny and slight of build. His red-brown hair is styled semi-stylishly, though it does have a tendency to do its own thing, and his chin is graced by a narrow pointy beard which he's tremendously proud of. He has a keen, focused gaze, his dark brown eyes seeming to soak in every detail of the thing they're looking at - and absolutely nothing to either side of it! Kellen's clothes are plain and simple, and appear to be based on a more heavy-duty form of scholar's robes. Personality: Kellen is upbeat and friendly, and often keen to help others. His real passion is expanding his knowledge of magic and spellwork, and he becomes rather focused when pursuing this goal. Kellen will also happily talk on his favoured subject for far longer than anyone would wish, often oblivious to the boredom of others. 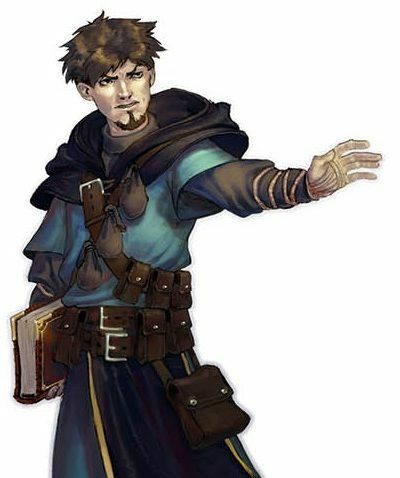 He is desperate to prove himself as a capable mage, and to push the boundaries of what is considered known. 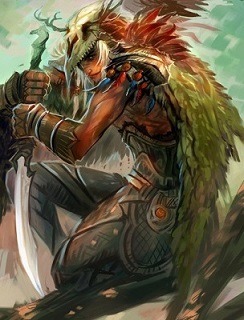 He is not confident in melee combat, and shies away from the risk of physical harm, but is willing to stand at the back of a fight and throw out spells. Backstory: Raised in the forest to a tribe of forest gnomes, Kellen always had a fascination with magic. When he was younger, and free of chores, he would follow the tribe's wizard around for hours at a time, marvelling in every little display of magic and soaking up every scrap of information the wizard shared. After he came of age, Kellen left his tribe to study in a college for mages, and it was there he learned to cast his first spells. He was never particularly happy with the masters' attitude that all that was worth knowing was already known, and his questions about different ways to cast spells were slapped down harshly. This, combined with the difficulty his family had in paying the college fees, caused Kellen to leave the student life behind. He began to look elsewhere for magical secrets that he could use, and it was then that he heard about a place where dungeons abounded. Everyone knows dungeons hold great secrets, and so off Kellen went to plunder them. Q&A What about this game concept appeals to you? The fast posting rate, and relatively straightforward nature. A deep and heavy-RP campaign is great (and indeed I'm playing in some at the moment! ), but sometimes it's the simple things one craves. The potential PvP conflicts, they're not really my thing. Hoping to avoid them as much as possible. Pretty new. I'm playing in two other PbP 5e campaigns at the moment, but that's the extent of my experience. I can do once or twice per weekday, but only after ~4pm UK time (I'm a school teacher, so really don't have free time during school hours). I can do multiple times per day on weekends, assuming I'm not away/busy that weekend. Last edited by Maladict; 09-17-2017 at 10:26 AM. Appealing Features: Straight-forwardness of the game, a true dungeon crawl. I play a lot of roleplay focused games, it'd be nice to kick back and just play for once. Non-Appealing Features: Speedy post rate. I work long hours with little access to the internet during due to the nature of my job. I may get left behind if my party is charging forward at a 2+/day post rate. Any questions you might have: None. Experience with 5e: Fairly experienced. Been playing for two years as a DM and a Player. The great thing Anthrueser is that you can hook up with the slightly slower posters as well - 1 post a day is not an uncommon number for posters in that game. Last edited by DeJoker; 09-22-2017 at 08:33 AM. Bump. The second game wide event is currently in the planning stages and we are running 5+ dungeons simultaneously every day with a total average post rate of 119 per day across the entire game world. If you've been on the fence about joining, now is the time to leap off! If you're tired of applying to a game only to find yourself rejected after 3 weeks of waiting - this game is for you. If you're tired of waiting a full week to get a response from a NPC - this game is for you. If you're tired of games that stall out after only a few weeks (or worse) - this game is for you. 14K posts and going strong. -Race, class, background, etc. : Human-V Fighter, former mercenary. Einar was born in a forest village, whose father was a woodcutter and war veteran. He grew up playing in the woods and roughhousing with four brothers and looking after three sisters. His father would spend the light hours felling trees while the children played and did chores, and by night around the fireplace, they would hear old war stories of campaigns far off, until they could (and did) tell the stories themselves, word for word. When Einar was old enough, he too (as all the brothers did) joined his father in taking up the axe for a living. His father taught the boys other ways to use the axe, as security in the far-off village was what you could make of it, and orc raids were not uncommon in the area. Einar grew strong and hardy, and eventually began dreaming of a life of his own. As he was never particularly skilled in talking with the girls in the village, he decided that the best way to start a family was to earn his fortune with his axe. He gathered a few belongings, bid farewell to his family, and headed off to the nearest city to join the army. However, once he reached the city, he was spotted by a mercenary company who recognized three things about the man: he was big, he was tough, and he wasn't too bright. In short, the perfect mercenary. They recruited him (it was easy enough...they talked to him of gold, instead of duty), and he learned the art of real battle within their ranks. Although homesick at first, he eventually grew to enjoy the lifestyle, and stayed with the band through several personnel changes. Eventually, however, most of the warriors he'd joined with were either dead, or had moved on, and he encountered problems with the new group. After breaking a man's neck in a brawl, Einar fled to avoid the wrath of the man's friends. -What about this game concept appeals to you? Auto-accept and fast pace. -Is there anything about this game concept that doesn't necessarily appeal to you? I do like to roleplay, hope there's at least a little of that. -Experience with 5e. Some...own the book and done some online reading. Mostly earlier versions of D&D (35+ years experience gaming). -Expected post rate. At least 1/day. Last edited by Andor; 10-03-2017 at 12:57 PM. "But you may call me Alastair, kind sir." Personality Traits: Being born outside of nobility, I do not place myself above other folk. We all have the same blood. I understand the problems faced by commoners in every day living. Ideals: It is my duty to protect and care for the people not as fortunate as I. Bonds: I wasn't born into nobility, I was adopted into it. Even though they are not blood, I will face any challenge to protect my family. Flaws: I often spend most of my time learning, either studying spellbooks, historical tomes, or travelers journals, and have little understanding of social life. I think I'm looking most forward to the faster gameplay in this adventure. I am also looking forward to interacting with other PC's that are just out and about, and not necessarily in my group. And finally, the open world feel. I have been reading some of the shenanigans in the High Town, and learning about the Guild Halls, and can't wait to participate! Conflict with other players. Will probably stay away from PvP. How will I know when my character is ready to start posting? And I have already paid for both a quarterstaff and an arcane focus (staff), for flavor sake, can I just say my arcane focus is my quarterstaff? Limited experience IRL. Most of my 5e experience comes from right here on rpgcrossing. But it's fairly simple (easier than 3.5), and I like to think I have picked up on it pretty well. Alastair Oswald MacArthur Beauford Goodwin IV of house Mathis - Dungeon Dive! Last edited by TwistedJester; 10-05-2017 at 03:39 AM. Role: Healing and Buffs with a side of... Oh Snap! Been DMing for the last year or so and I am looking for a chance to just be a player again. Also I feel that it might be easier (creatively) to focus on post volume instead of the more taxing (writing-wise) role play. Nothing springs to mind. We'll see if I can keep up post wise. Playing mostly 13th Age and 4th addition in the last two years, but have plenty of D&D experience. Once / day, sometime more. Very occasional lapses (I sometimes travel pretty far up North to places with little or no internet/phone service). Saagorski Imland was captured when his coastal fishing village was sacked by raiders. As an able bodied young male he was immediately chained to an oar and given a chance to earn his life back, or die trying. Though few endured the whippings and relentless toil, Saagorski survived, grew strong, and eventually thrived. He was regarded by many on the ship as a bit of an anomaly. He seemed to heal faster than the others, could sense the weather changes, and had a certainty about his purpose that was off-putting for a galley slave. Still, after ten years his chains were unshackled and he was given another opportunity, or at least a glimpse of it. This time he was offered his freedom, once he could buy it, with his small share of the spoils. Saagorski was a now officially a hired hand, indentured but one of the crew. He learned to fight and often participated in the same savagery once leveled against his own small village. Often though in the chaos he would find some small retribution he could return upon his harsh masters, or some small healing he could project on the innocents they slaughtered. He would heal a man's back, or at least take away his pain when the flogging started. He would call in a fog off the waters and hide a small village as the longships passed. Many little things he found he could do. It happened time and again and he couldn't explain it, until one day he could. It came to him in a delirious fugue during a weeks hard row against the current in a dangerous strait. It was his God. Njord! Even as he so realized it the current seem to eddy behind the galley push them into the middle of the straight where the wind filled her sails. It was Njord, and he was pleased. From here forth it would be his destiny to serve. Even with the blessings of your God though, life can be tough and people are molded by the trials of their lives. Saagorski became a hard, hard man in many ways, but he scrimped, saved, and eight years later he paid for his replacement. Another vessel for Njord maybe, another enslaved young man, not much older than he had been, a young and prideful giant of a kid, who promised to murder him one day. The youth was spitting curses for Saagorski's betrayal of his people, for what he had become but the seaman just grinned, seeing himself in the brash boy so long, long ago. Turning from the boy he leaped over the side and into the waist-deep freezing waters. The boy still screamed after him, taunting and swearing oaths to the gods, but Saagorski just strode up the beach with indifference. He knew the Gods. He had felt their glory and their wrath. What lay ahead for the boy, if he let that anger fuel him, let it drive him through the terrors to come just might be salvation. Maybe. But he'd be someone else on the other side, a man Saagorski would welcome and respect. With a determined set of his great bearded chin he walked away from the sea. Njord would lead him back when his work was done. In the meantime, high in the mountains or out on the plains, under the cool blue sky or deep beneath the earth. The location mattered not. Last edited by Tongue; 10-11-2017 at 11:55 PM.